All right I presume you’ve got the torso assembled or almost. The assembly of the neck shouldn’t be a too difficult step. None of the servo used need to be transformed, they can be set as is. That’s pretty cool. NOTA: I have designed a New Neck mechanism which is available for download in the Gallery, but is not shown in the below tutorial. Use “GearHolder” and set “ServoGear” through it. Screw the actuator wheel sold with your HS-805BB servo to “ServoGear”. Use your Arduino board and set your HS-805BB servo to 90°. Puch it in the turntable. This a bit tricky but can be achieved using a magnet on your screwdriver. Using the screw delivered with the servo, you need to screw the turntable to the servo inside “ServoGear”. Keep your servo at 90°. Mount this assembly to the assembly “MainGear” and “NeckHinge”using some grease to ease the rotation. “GearHolder” should be aligned with “NeckHinge” and your servo should be still at 90°. Fix the “LowBackRight” and “LowBackLeft” or “Temporary” to “GearHolder”.This will be the back of the skull. Screw “Ring” to “MainGear”. Try to avoid slack between parts. Use your favoriet pliers to mount “FaceHolder”. You can mount both of them. Now lets build the jaw. Take “JawPiston” and turn it inside “JawHinge” until you get 1cm offset between them. Mount screw this on the turntable of your HK15298 or similar servo. Set your servo at 0° with the arduino board. Keeping the 1cm offset, “JawHinge” should be mounted at a 90° angle compared to the servo. Mount screw “SkullServoFix” over the HS-805BB servo. Put all 4 screws. Don’t mind the wires on my pictures they come from cameras. Now take your HK15298 assembly and slide it through. Put all 4 screws to fix your HK15298 servo. Remove the pre-support from “Jaw”. My “Jaw” shown on this picture is only a half part. It was a previous test print I did. Your “Jaw” is one piece print. Screw “Jawsupport” to “Jaw”. Make sure the flat surfaces of the “Jawsupport” are on the inside. Fix in “ThroatHole”. Mine looks different than yours. Sorry for this picture but “ThroatPiston” and “ThroatPistonBase” shouldn’t be already mounted, it comes in the next steps. Assuming you have already fixed your HS-805BB servo in the Torso assembly. Set your servo at 90° with arduino board. Turn “ThroatPiston” and “ThroatPistonBase” in a matter to get “NeckHinge” straight flat. Screw “ThroatPiston” to its turntable keeping your servo at 90°. Now the whole head should be able to go up and down if the servo turns from 0 to 180. Make a test with the arduino. Run this test carefully. Leaving the head up, Slide the jaw assembly in to the head. Using washers, set screws in. 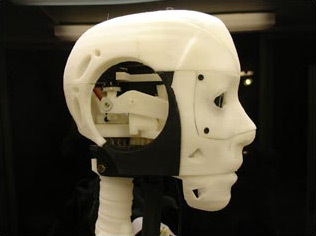 Run a test on the jaw mechanism with Arduino. You can run the cables of your servos in the “Neck”. Now you should be set to move the head and the jaw through your Arduino. Check InMoov service Myrobotlab for pin connection to get this added to your robot. now i need to test them separately, how can i get these separate minmal codes for testing. You might want to use the forum to chat with other builders. Sometimes I’m just too busy to help and answer questions on the site. Here is the link to the minimal for the torso. Beware voice might not work because MyRobotLab has been updated. Hello Gael, is it on your To Do list Maybe put the bobHouston neck upgrade on the tutorial? Hello Pedro, As you may know, I do not integrate upgrades from other builders into my original design (beside the eyes mecanism). So no tutorial in the near future about that. Although, I have been thinking for that matter, to create a second tree line on the website which would be dedicated to upgrades voted by the community. That is on my to do list! I didnt know, i was just asking since i saw that on your second inmoov u are using it! It is pretty awsome and would be nice to be integrated as a tutorial imo!! Once again thank you so much for this fabulous work! Your idea of making a votation seems super cool!! Hey, you wrote: “HK15298 or similar”. The HK15298 is sold out 🙁 What similar servo I can use? Hi, Please check the Hardware and BOM page to see other possible servos. ı can not fine 3of 27 and 5 of 27 part of servo ring. how am ı able to print to this parts. Sorry I do not understand what you are looking for and which part you are referring to. Dear Geal thanks for a link if i any questions i will ask you take care….Ps: We are working in a new silicone skin on inmoov, we’ll share whit you in future. Thanks again. ı can not fine 2 of 27.which we must screw(Use “GearHolder” and set “ServoGear” through it. Screw the actuator wheel sold with your HS-805BB servo to “ServoGear”. )that part. Where do throatholder and throathole go? Congratulations for your amazing Inmoov design! I’m a high school teacher and I intent to introduce the Inmoov robot to my students! I’ve just finshed the head but there is a problem on TopBackskullV1.stl files. Something is going wrong with the half part (I use repetier sotware). Great to hear a Greek class is going to work on building an InMoov! Maybe try using another software than repetier. Cura for exemple is much better than Repetier. Je suis étudiant à l’université de Valenciennes en Licence professionnelle et je travaille sur le projet INMOOV. Je m’occupe de la partie tête et cou et j’ai besoin de savoir approximativement le temps que cette partie met à être imprimé pour l’élaboration de mon gantt. Tout va dépendre du logiciel et de la configuration de celui-ci, ainsi que de l’imprimante utilisée et de la matière employée. Votre logiciel devrait avoir cette fonction afin que vous puissiez établir une liste approximative du temps d’impression pour chaque pièce ainsi que du poids de matière consommée. I do not know what screws I have to use ? You have a list of hardware and BOM available, but keep in mind that it is not explaining which screw goes where. It’s really up to you to use what ever you can or find in your workshop or hardware store. this servo for the mg995 jaw is fine? I do NOT recommend the MG995, their controler board is terrible. They burn much too easily. Personnaly I use the HK15298 or HK15298B for the jaw with never a burning servo. Congratulations for this excellent project! I looking the servo HS-805BB but in hobbyking is discontinued this product. What servo motor I can use? Have a look for the list of other servos in the Hardware and BOM page. The PDI-HV2060MG are very good. Robots to aid people how? InMoov is designed to help people and students to create the next generation of Humanoids with a Open Source AI. All programming info is on the website InMoov.fr. Check the tabs in Build yours/How to install MyRobotLab. J’aurai une petite question concernant le cou. Je ne trouve pas Neckhinge, et il y a d’autre pieces comme neckplate qui ne sont pas dans le tuto. Y a t il quelque part une vue éclatée de inmoov avec les nouvelles pieces? Merci pour vos réponses et votre travail. Si vous vous rendez sur le forum inmoov google group, en faisant une recherche “new neck”, il y a des sujets qui sont en liaison avec votre question, à laquelle, j’ai répondu en postant des photos et liens. If you print the new version, You don’t need NeckHinge. I can’t find the tutorial on how to attach 2 size neck piston and neck servo holder to the torso. Can you tell me how to do that thanks.